Overseas travel history: United Arab Emirates (Dubai): 1998 – present. Despite being 100 percent British, I never felt at home in England. As young as six years old I used to wake up feeling “displaced.” I was unable to identify that feeling until I moved to Dubai and realized that the feeling had gone. To be honest, I think “home” could be anywhere that has a positive attitude, hot sun, blue sky and a glittering sea. My father grew up in India as the child of expat parents and so my own childhood in England was full of stories of hill retreats, jungles, hot sun, ayas and curries. My mother was born to expat parents in Romania. My aunt emigrated from the UK to Canada. So you’ve felt the most displaced in your homeland? Yes. Growing up in England, I felt like an alien. Throughout my teenage years I plotted my escape. I knew I would leave as soon as I could. It was just a matter of when, where and with whom. Even now, when I go back, I feel like a foreigner. Is there any particular moment in Dubai that stands out as your “least displaced”? Probably the first weekend after my husband and I moved to Dubai — when we sitting on the public beach watching the sun go down and the sand turn from white to pink and listening to the azaan (call to prayer) echo across the beach. I had that first flutter of “This is home! We’re not on holiday!” excitement, which still continues, even after 14 years. A plastic mosque alarm clock that wakes you with the azaan [see photo inset]. We’d wash it down with a rich red wine from Lebanon’s Château Musar, Ksara or Kefraya. For dessert I would offer you a delicious Umm Ali — an Egyptian version of hot, bread pudding, served with a little vanilla sauce. And, of course, a cardamom-laced Arabic coffee to finish. This month we are looking into beauty and fashion. What are the best Emirati beauty secrets you’ve discovered? From observing highly groomed Arab ladies, I’ve learned the value of the perfectly shaped eyebrow – something to which I’d barely paid any attention in England. I’ve also discovered the joys of a good scrub in the hammam. It’s not Emirati per se, but does have a long history here. And although you don’t often see a UAE national lady without her shayla (rectangular headscarf), the beauty salons are full of Emirati ladies having their hair blow-dried — I’ve learned to get my hair professionally “blown” before any major social event. It gives you an instant polish that makes all the difference. What about fashion — any beloved outfits, jewelry, or other accessories you’ve collected in the UAE? Emirati ladies put a lot of thought into accessories such as sunglasses, handbags and shoes, given that the rest of them is covered by the abaya (robe-like dress or cloak) when out in public. I’ve picked up their habit of using a great handbag to pull a look together. I also have a beautiful, jewelled black thobe (ankle-length garment traditionally worn by Arab men) that doubles up as a great evening dress. Editor’s note: Annabel Kantaria was awarded one of The Displaced Nation’s “Alices” for a post she composed about the need for “behavior lessons” before working in the UAE. 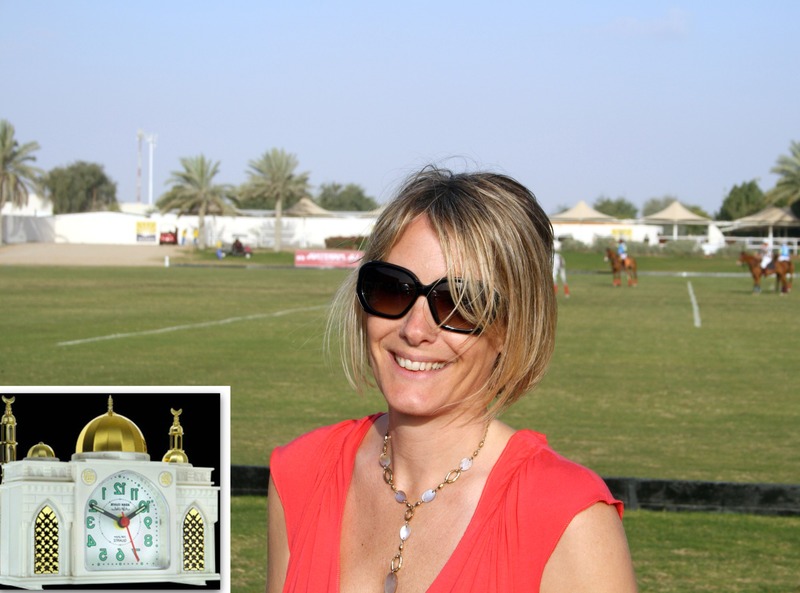 img: Annabel Kantaria at a polo match in Dubai; inset: her plastic mosque alarm clock, which she proposes to bring into The Displaced Nation. Now I understand completely. How odd that when I got to the UK from Uganda, I felt like I had arrived home! Yay for Annabel. We would have a great time together over mezze talking about our experiences. I was married in Kenya as well, in Nyeri, not Nairobi, and having lived in Palestine, I love mezze and other Middle Eastern food. Loved your story, Annabel! I am Irish, brought up in the UK and now live in Canda. I confess to having a fascination with the middle east but don’t know how it would sit with my aversion to being told what to do. As a female muslim, I imagine I would spend a lot of time biting my tongue… and i would resent the pressure to cover my hair. Yah! Great post, I’ve always wanted to visit Dubai, Annabel’s story is beautiful and slightly romantic! Go Annabel! Yay from me too, forgot to put that in. To be honest, I think “home” could be anywhere that has a positive attitude, hot sun, blue sky and a glittering sea. But seriously do you think you could have settled well into any of the UAE states, and it just so happened to be Dubai? yay from me………one things i want to say , For the last decade expats have been moving to Dubai in large numbers, often lured by the promise of tax-free wealth and luxury living. expats can both buy property and own land in Dubai, a legal right otherwise limited in most other parts of the Middle East that certainly serves to entice international investment.